Penthouse #1 is a magnificent unique rental in Chicago. 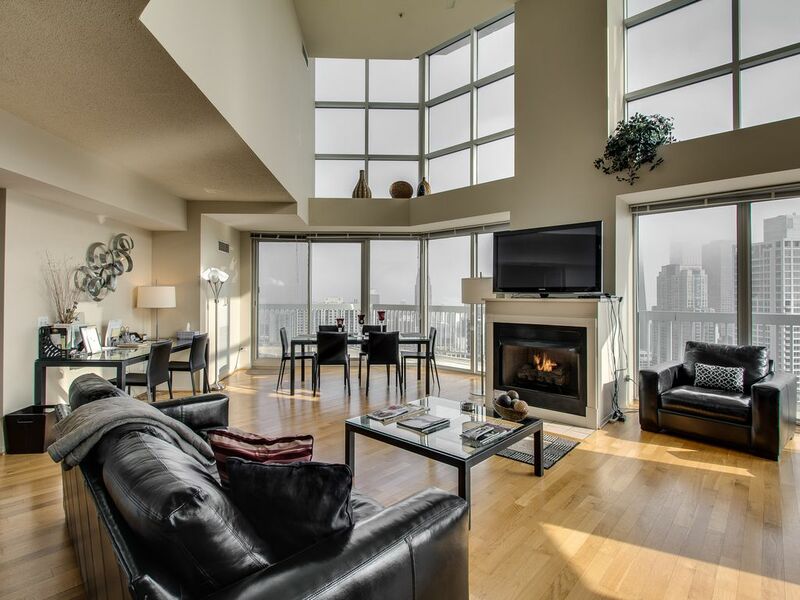 Towering above the city, with dramatic living areas and exquisite fireplace, this Penthouse gives you the ultimate in city living. It's all about the views and location. From 20 foot floor to ceiling windows the city unfolds before you with Lake Michigan as a backdrop; nowhere in Chicago can you stay with views like these. Bordered by the elegance and glamor of North Michigan Avenue to the east and the artsy sophistication of the River North District to the west, Penthouse #1 is at the heart of one of Chicago most exciting neighborhoods. Life here is flavored with world class shopping, the best of casual and fine dining, galleries and clubs. In Real Estate they say 'location, location, location'. We have that. What we say is 'views, views, views'. Few cities have building as tall as Chicago, fewer still have rent-able Penthouse units. This is you opportunity to experience luxury living at it's finest. Each Bathroom has a hairdryer,Q-tips and make-up pads. Just 2 blocks from 'The Magnificent Mile'. Located in the heart of the River North district. Stunning views of Lake Michigan. This Penthouse has the best view of Chicago and Lake Michigan. State of the art fitness center, sorry no children under 18. We loved our stay here - perfect location to everything and very comfortable for 5 of us. Chicago such is a great and warm city with lots to do and friendly people. A lot of maps and recommendations in the penthouse to help guests navigate the city. Chicago Penthouse . . . Incredible!!! We we’re visiting from Los Angeles for my grandmother’s 90th birthday. We decided to make it a long weekend (Fri to Tues), and looked for places to stay downtown Chicago. I wanted to keep the family together instead of renting separate rooms at a hotel. We came across the penthouse and were immediately intrigued. It was the best decision we made, absolutely spectacular! My wife, daughter, son and mother (all adult/young adult ages) just loved it!!! 55th & 56th Floor, WOW!! Upon entering the two story penthouse you’re immediately drawn to the amazing view from the living/dinning room area. The windows went from floors to ceilings across a large living space. They had 20ft ceilings that made you feel like your living in the clouds. There was a balcony outside the 55th floor that went across the property, AMAZING!!! I got the best pictures of the city and Lake Michigan. Kitchen - Had everything we needed, Prefect! Bathrooms - full size, Perfect! Living/dining - Great Space, Perfect! The property staff we’re extremely helpful and very pleasant. The location of the property was right in the middle of it all. We shopped on Magnificent Mile, walked the river walk, went to Lincoln Park Zoo, and made it to the Cubs home opener. Not a problem with Uber, catching the subway and parking our car. Jim and Jeri-Lou (Property Owners) made sure we had everything and provided a very detailed instruction guide on where to park, picking up keys, etc.